One trend I just can't get enough of right now is tissue paper flowers! 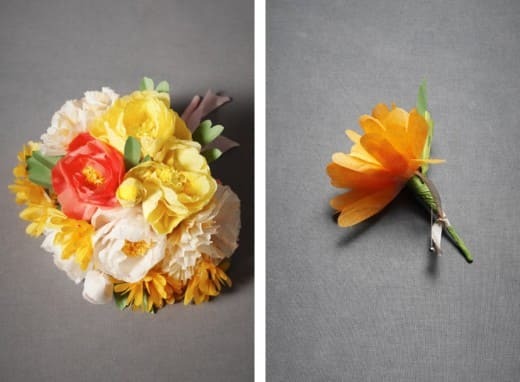 Perfect for bouquets and boutonnieres alike, these paper flowers are timeless (literally!). With crepe-paper flowers there's no need to worry about preserving your bouquet and the buds stay perfect long after the last dance. Plus, they are much more durable and won't droop or wilt. This bouquet from BHLDN is one of my absolute favorites. The arrangement is comprised of chrysanthemums, camellias, and peonies in pretty pink and yellow tones- perfect for a summer wedding. 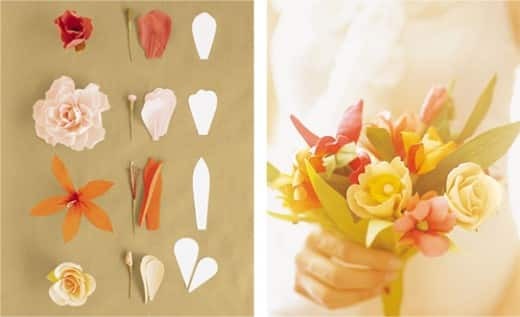 Prefer to make your own crepe-paper flowers like the ones pictured below? Check out Martha Stewart Weddings for a DIY guide. What do you think of the crepe-paper flower trend? Would you consider sporting these blossoms on your big day?